"This is a super stable, delicious, easy-to-make Swiss meringue that's perfect as a base for Swiss meringue buttercream or as a topping for any pie you want to make! Because it's whipped over a bain-marie, it doesn't need to be baked - which makes it especially great for my favorite lemon icebox pie (I suggest trying that if you're into lemon meringue pie!). Precision is important, otherwise it's as foolproof as the title says. Hope you love it as much as I do." Bring 2 cups of water to a simmer in a medium pot. Combine sugar, egg whites, salt, and cream of tartar in the bowl of a stand mixer. Reduce the heat of the pot and place the bowl over the steam. Whisk egg whites lightly until a digital or candy thermometer inserted into the mixture reads 160 degrees F (71 degrees C), 6 to 10 minutes. Remove from heat immediately. Place bowl back onto the stand mixer with a whisk attachment. Whisk on high speed until egg whites are cool and stiff peaks form, about 3 minutes. Mixture should hold peaks effortlessly and start balling up around the whisk attachment while appearing silky, shiny, and pure white. Use meringue immediately. It will hold its shape without separating for about a week in the refrigerator. 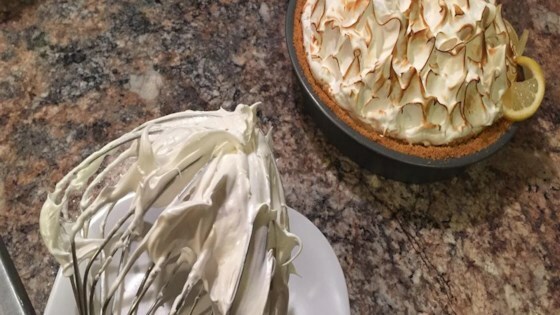 To effortlessly cut your piled on, torched meringue pie: Run a sharp knife under hot water, wipe clean, run both sides over butter... repeat before each slice. It isn't whipped over a bain marie. It is heated, stirring, over hot water, then whipped in the mixer.